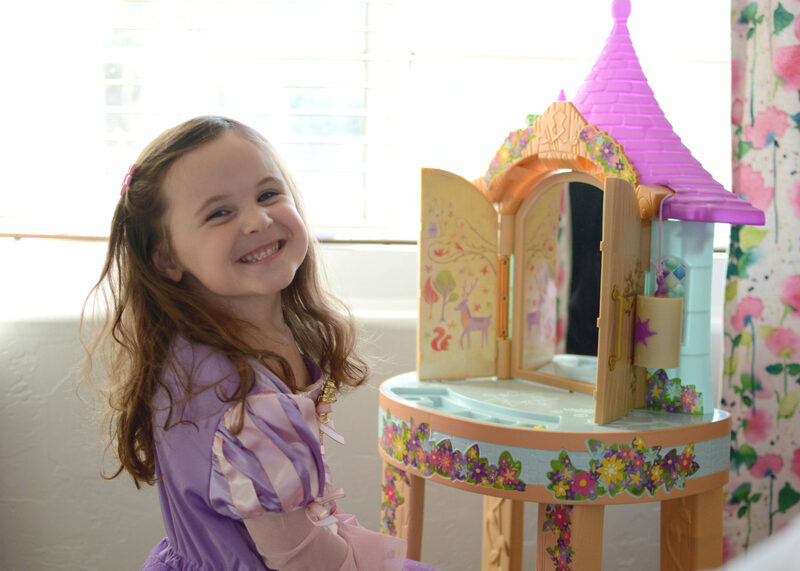 Thank you to JAKKS Pacific for sponsoring this post on Toys Fit for a Princess! I was gifted these toys for the purpose of a review. All thoughts and options are 100% my own. For more information, please see my disclosure policy. If you’ve never heard of JAKKS Pacific, you’re not alone. I’d never heard of them either. 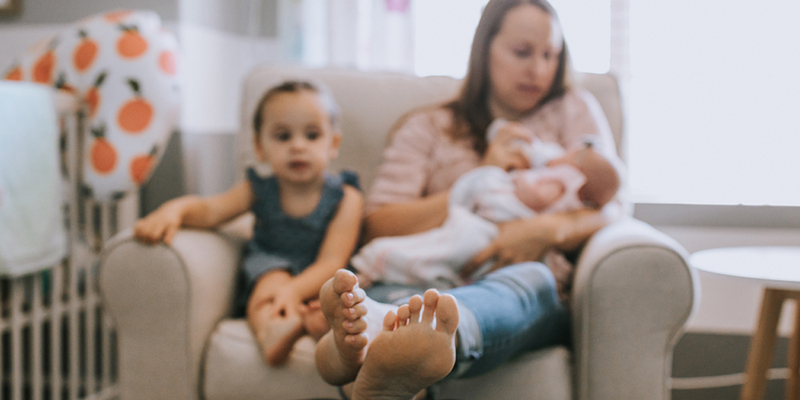 But if you’re a parent, like me, your house is still full of their toys. They make popular children’s toys such as Daniel Tiger, Disney princesses, and Black & Decker tools. 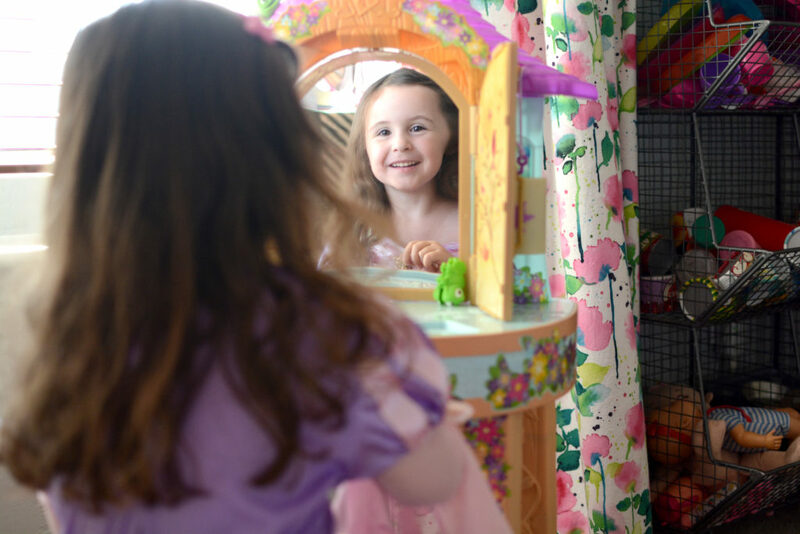 So when I was approached to review a few new toys featuring Disney’s Princess Rapunzel, this mom of a pink-loving, tutu-wearing, princess-adoring girly-girl jumped at the chance! 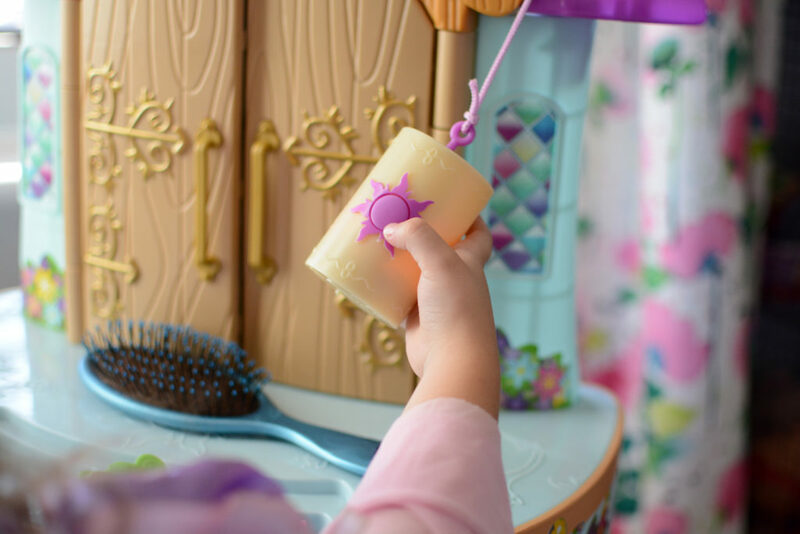 The first item is the Disney Princess Rapunzel Tower Vanity (exclusive to Walmart). 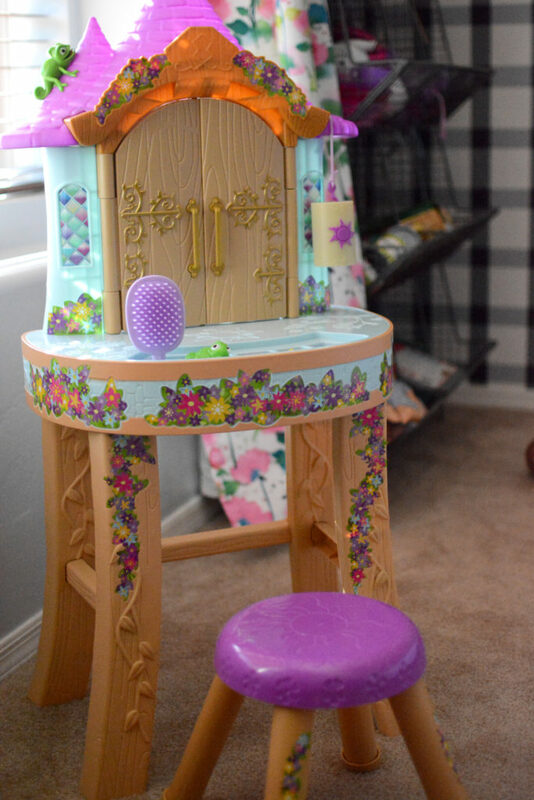 This beautiful vanity is inspired by the tower from Disney’s Tangled. When you open the vanity doors, the little lantern rises up and plays the song, “I See the Light.” Pressing the button on the lantern front makes the lantern glow! While I love the sweetness of the lantern rising when the doors open, it rarely plays music when it does. It seems like the lantern may be too light to properly depress the button on it’s underside when it’s sitting on the vanity. It’s still a cute feature, I just wish it worked better. 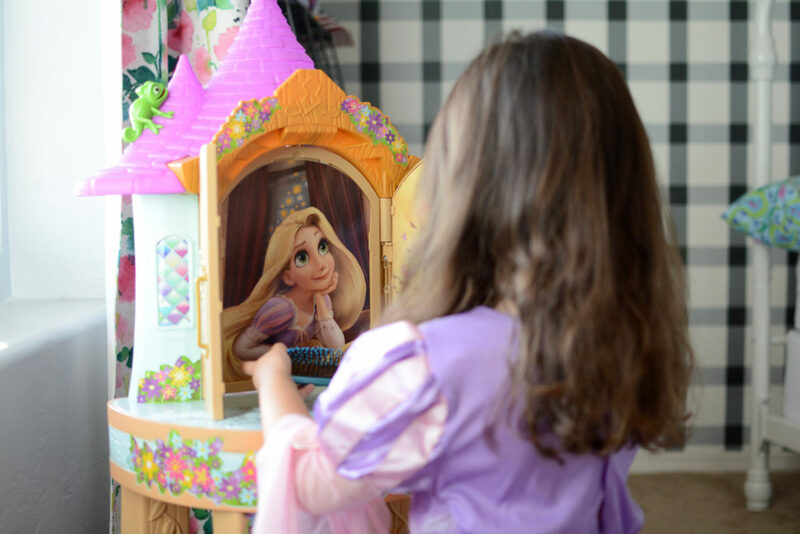 Once the vanity doors are open, your little princess can choose to gaze upon a picture of Princess Rapunzel or rotate the insert to reveal a mirror, perfect for admiring her reflection while she styles her hair! 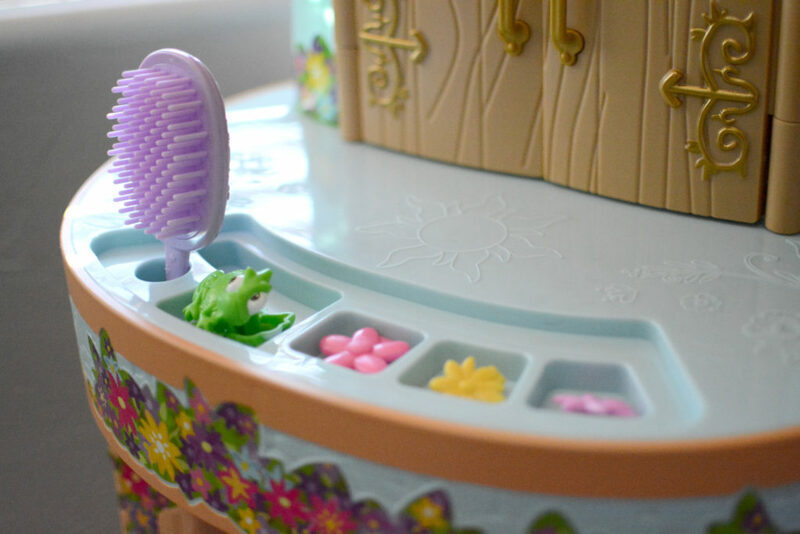 The vanity also comes with several clips (including one in the shape of Rapunzel’s best friend, Pascal) and a brush. Putting the vanity together was fairly easy. No special tools required. The hardest part for me was the stickers! 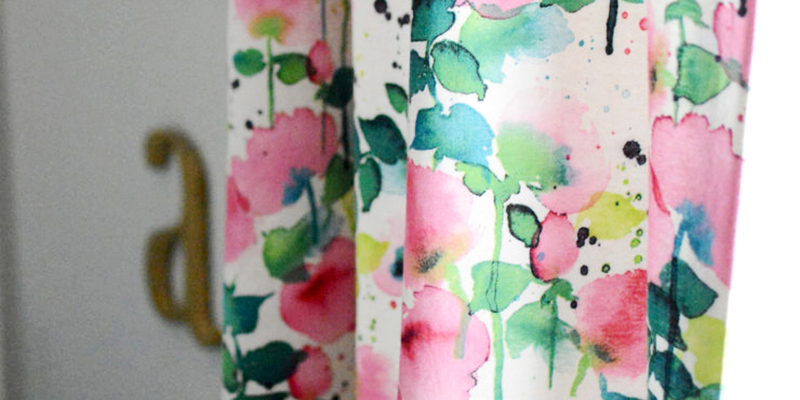 The colorful, floral stickers don’t come pre-applied to the vanity. They come in a big sheet that you then peel off and apply yourself. My very Type-A personality had a bit of a hard time with my sticker application errors, but the vanity still came together beautifully! Both of my princess adore playing at their vanity. 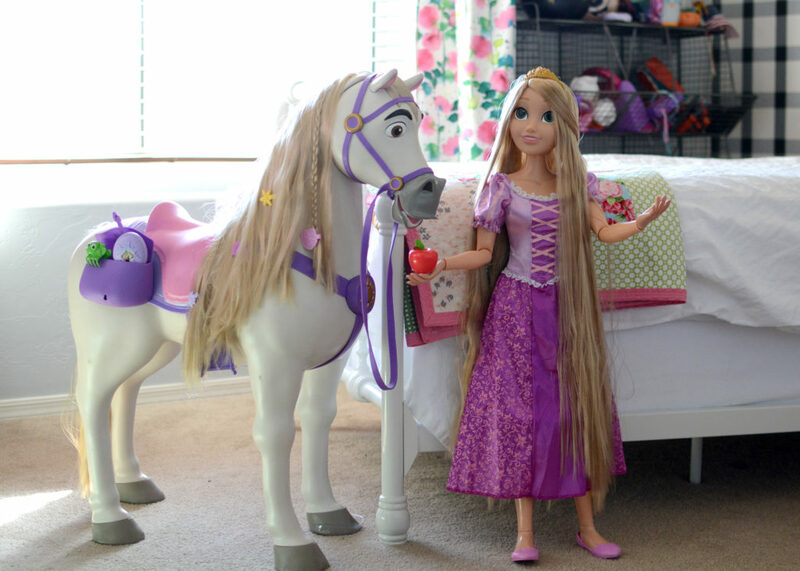 It’s the prefect addition to their ever growing collection of princess toys. 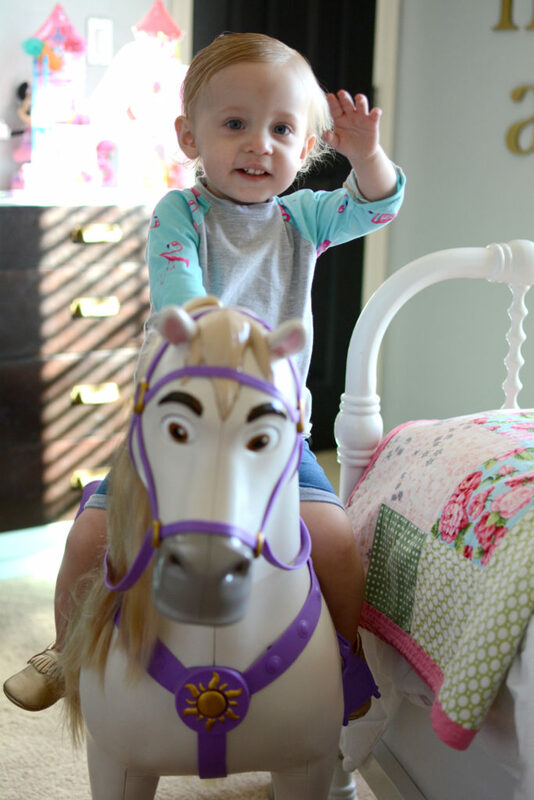 This pretty princess is 32-inches tall, with adjustable neck, shoulders, elbows, wrists, hips, and knees. Charlie is fascinated by her! Her dress, shoes, and tiara are removable, and she comes with a brush to comb her long locks. 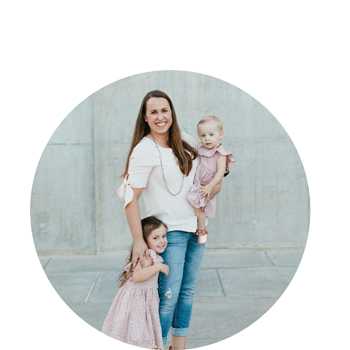 If you’ve followed my Instagram stories, you may have seen me document my visits with our house’s hair stylist extraordinaire (otherwise known as Emma). 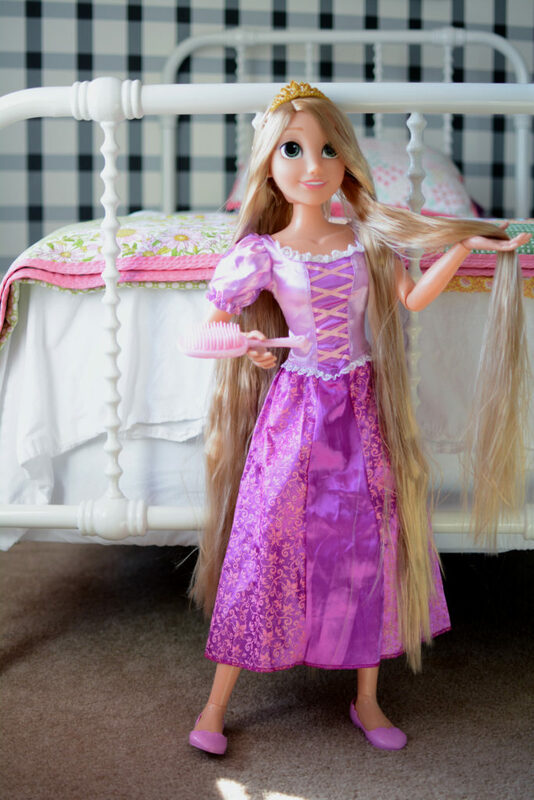 So I know she’ll love combing and styling Rapunzel’s hair just as much as she will having tea parties together. 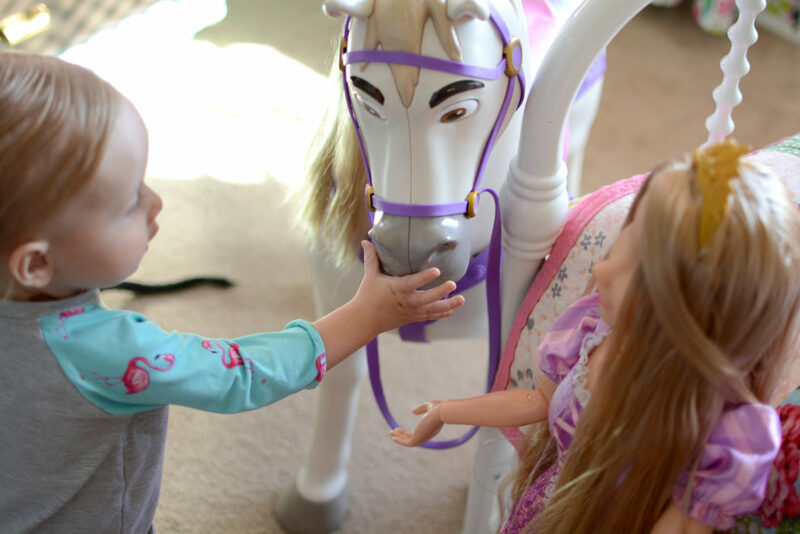 And where would Playdate Rapunzel be without her trusty steed, Playdate Maximus? 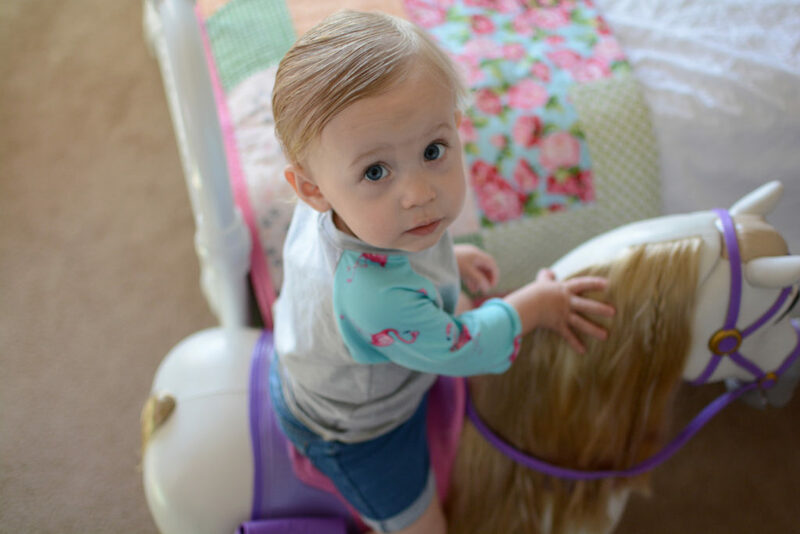 Maximus stands at over 2-feet tall and includes a brush and hair clips, to groom his gorgeous mane, as well as a saddle bag for storage. Pull the reins (or push on his head, as Charlie discovered) and he’ll respond with motion and sound. Or you can feed him his favorite treat, an apple, and he’ll hold it on his mouth and make munching sounds. 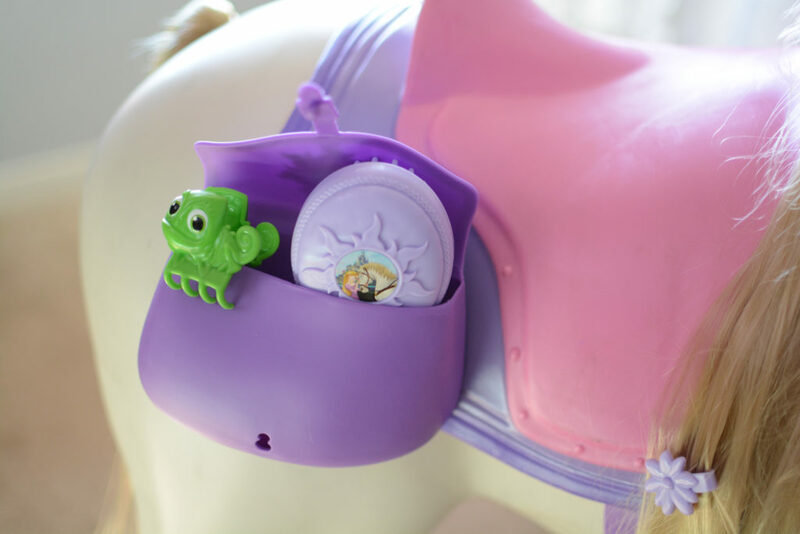 Recommended for ages 3+, Maximus can hold up to 70 lbs, perfect for Rapunzel, or other smaller riders. 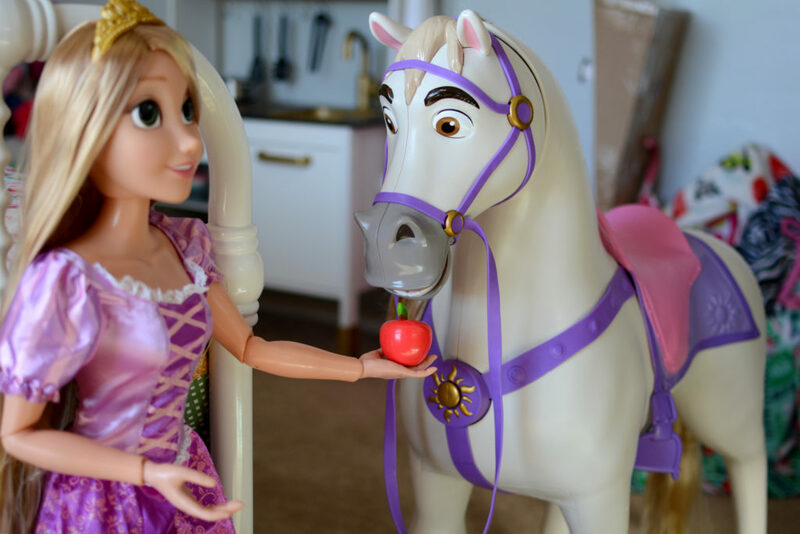 These Tangled toys are so cute and my girls love them. Now, my only problem is how to get the girls to stop fighting over them! 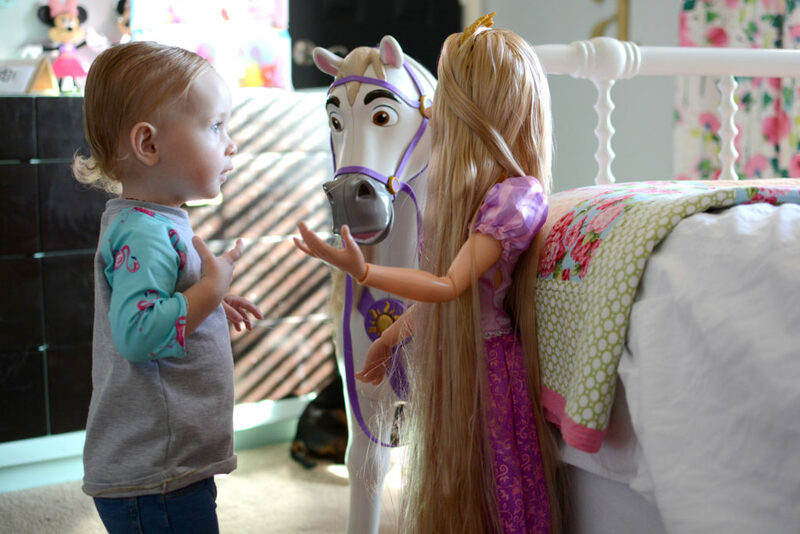 These toys are the perfect addition to your little princess’ toy collection. 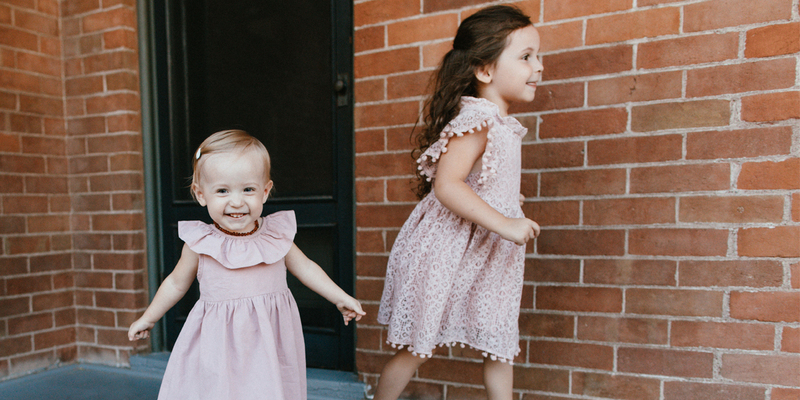 Do you have a little princess of your own? Who’s her favorite princess?